The 50k, 27k and King/Queen are all part of the Skyrunning USA Series and rankings! 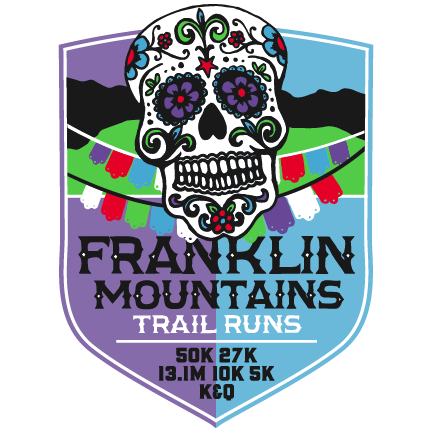 The Start/Finish will be at the pavilion area circle inside of the Franklin Mountains State Park. All 50k runners should be aware that this is a mountain ultra and there will be inherent risks involved in running this trail race. 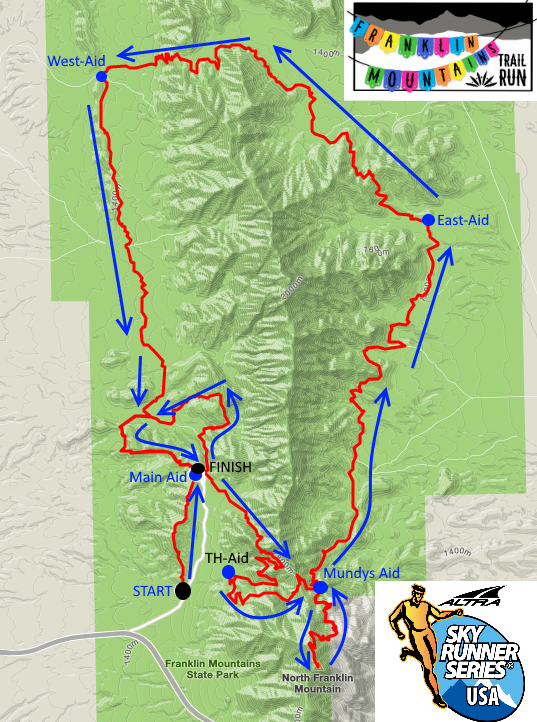 There will be portions of the course that will be off trail, up/down scree fields, and next to cliffs on either side. All runners should have a water carrying capacity to last them 6-7 miles, which could be 2-3 hours of walking/hiking. Also, be aware that you will not be taken in from the course if you drop out of the race. If you drop out you need to do so at an aid station. In the case that you are hurt on the course and cannot continue, we will use the Park Search and Rescue to insure your safety. READ THE AMAZING COURSE PREVIEW by GREG LUFFEY BELOW!! The recommended routes for each distance will be about 3.5-8.0 miles which will start at the Mundys Gap trail head and go to the peak of North Franklin Mountain, and then back down to the start. We will use off trail/scree fields for some of the route and there are inherit risks involved in that. We may also have multiple routes as this race is meant to have you see how you can get to the top the fastest and back down. To finish you must go to the TOP, get a summit band, and return down. This is the only way to finish. 2:00 pm Cutoff at Mundys Gap aid station. This is a HARD CUTOFF. You have to be passing back down the mountain and passing Mundys Gap aid station by 2pm. Main Aid - This is the 5.3 Mile Aid and also Finish Line as well. 26.0 West Aid -> Hwy 85 North to Colonia Vista take a right. Left on Sotol to Canyon Ridge. We will make appropriate places to stop and park depending on conditions. Walk will be between .5-1.0 miles. You need to have your BIB NUMBER, NAME, and AID STATION on each drop bag before you drop it. All drop bags for 8.5, 20.4, and 26.0 must be at the starting line no later than 5:30 am. You get your choice of swag on line but here are the shirt mock ups as well. A huge thank you to ALTRA RUNNING as they will be providing ALL RUNNERS with these amazing Altra Wraps for the 2019 Franklin Mountains Trail Run. Top 3 Men/Women Overall and Top 2 Masters 50+ Male/Female for all distances. Finishers Medals for all 5k/10k/13.1 and 50k runners below. We will have Elevation Culture custom medals for 27k runners, If you run 2 days or if you run the Triple of a race everyday.